Toddler a**holery is a normal part of human development—not unlike puberty, except this stage involves throwing food on the floor and taking swings at people who pay your way in life. 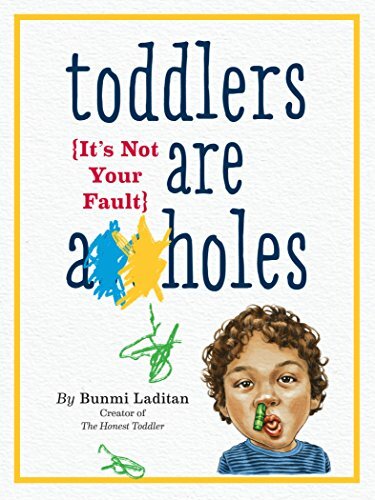 For parents of toddlers, it’s a “you better laugh so you don’t cry” period.Bunmi Laditan’s hilarious, satirical guide to toddlerhood offers parents instant (and very welcome) comic relief—along with the very good news that “It’s Not Your Fault.” Chapters cover the cost of raising a toddler, feeding your toddler, potty-training, tantrums, how to manage the holidays, and “how not to die inside.” Parents will see themselves in the very funny sections on taking your toddler to restaurants (“One parent will spend their time walking your toddler around the restaurant and outside like a cocker spaniel, while the other, luckier parent will eat alone.”), Things You Thought You’d Never Say That You Now Say As a Parent of a Toddler (“I can tell you’re pooping because your eyes are watering.”), and how to order pizza (“Spend $40 on pizza delivery. Listen to your toddler cry for 30 minutes about how the pizza is all wrong. Watch your toddler take a small bite of crust. Google ‘can anger give you a heart attack?’ Start the bedtime routine.”). Laditan’s wildly funny voice has attracted hundreds of thousands of fans of Honest Toddler on social media; here she speaks parent-to-tired-parent, easing the pains and challenges of raising toddlers with a hefty dose of adult humor and wit.